The Apollo heavy duty model is one that is very affordable, and is a popular choice for many UK buyers. Now this one is not that well known of a brand, but those who have bought this one, certainly seem to think that it does a very good job indeed. Below we have conducted a full review, on this very popular choice. Overall buyers have given this jigsaw an 82% buyer satisfaction rating. We have summarised below what buyers actually said about this particular model. These are very useful as people have bought this 600 watt jigsaw, used it, and then taken the time to rate and review their thoughts. They then allocate a rating and do a review of the product. We check those ratings and reviews out, and then summarise those. That should save you the bother of having to do that. 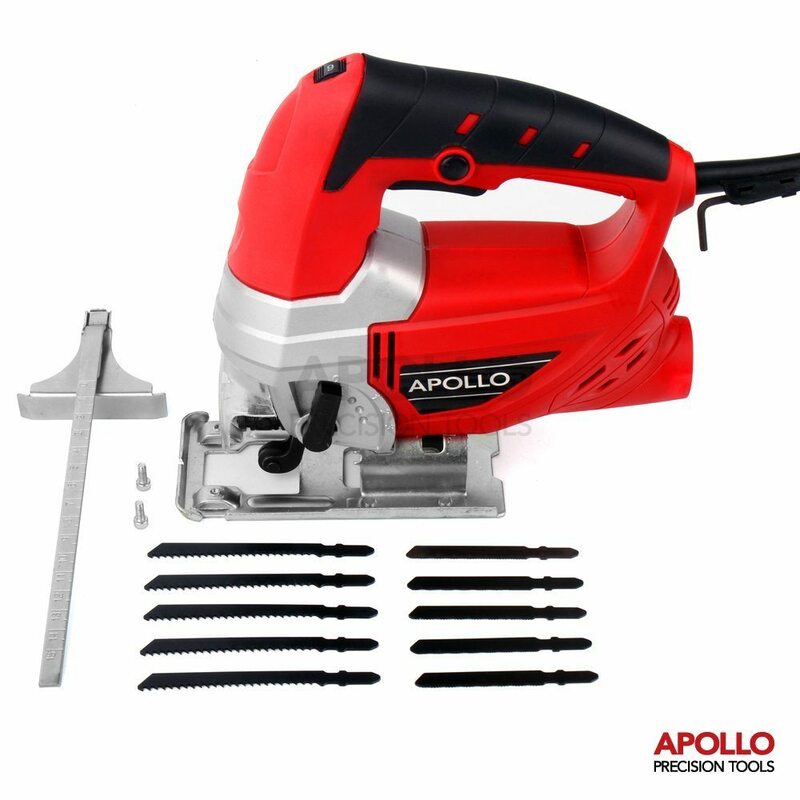 When we did our research we found that about 9 out of every 100 buyers gave this Apollo jigsaw a bad review and a poor rating. In contrast to that around 60 out of every 100 people gave this one the full 100% buyer satisfaction. Overall then this received an average buyer satisfaction rating of 82%. Those are all good enough signs in terms of ratings. If you decide to buy this one, then according to buyers, you will be well pleased with your purchase. Now that we know what the buyers think, let's look at this Apollo jigsaw in more detail. Below we have listed the key features of this jigsaw, and also explained what those features can be used for. The speed can be adjusted by using what is called a thumb wheel. This is good enough in terms of value for money. It will do all the basic cutting very well. If you are someone who does some DIY around the home and needs a jigsaw from time to time, then this one will satisfy most of your needs. It isn't a high end jigsaw and it's not one that a professional or someone in the trade would buy, but for general purpose work it is fine. Straight cutting is no problem, the blades are thin enough to do tight curves, and you can also do circular and plunge cuts. This type of jigsaw does not take a lot of setting up. There is a quick release mechanism for the blade which is good. We noticed however when checking out the reviews that a number of buyers received instructions that were not in English. If you are used to working with a jigsaw, that really will not be an issue. However if you are new to these saws, then that of course would be a problem. Most buyers said that the saw is powerful enough. Around 2-3% of all buyers did however say that they smelled a burning smell when they started using it. As a result they had to send it back and get it replaced. You should not really smell any burning from your actual saw. It is however possible, depending on what you are cutting, to smell something. Usually that will happen if the blade is blunt or it is going to fast for the material being cut. Test the saw by just switching it on and not cutting anything. If you smell burning send it back. This is a feature that most home users will never really use. It is a handy one to have though if you ever do. This one can do up to 45 degrees and any range under that. It is a handy feature for doing neater edges and for some joints.​ A bevel joint is simply a slanted joint. Just below we have summarised what we think overall of his jigsaw. Most buyers are pleased with their purchase. Compared to others this one is slightly cheaper than the average. If this is not the jigsaw for you, then please check out our top 10 list of jigsaws by clicking here. This is a decent slightly better than basic jigsaw that will allow you to do most jobs requiring a jigsaw around the home.